Before taking that summer vacation, more than 95% of Americans will use an app or website for initial research, price comparison and for booking. (The other 5% start, and end, with using a trusted travel agent). If you are getting a hotel, renting a car, taking a cruise or flying someplace these apps and sites can save you significant time and money; They’ll also help you with planning a vacation which meets your desires and (hopefully) your budget. Expedia, Hotwire, Orbitz, Priceline, TripAdvisor, and Hotels.com are among the best traditional brands for vacation-planning. Members only American Automobile Association (AAA ) is well worth the annual fee for their travel deals, along with all their other benefits. Let’s dive right in to the other gadgets and tech to make this a memorable summer! To make sure you’re protected from the sun, the free iTanSmart iOS app measures how much exposure you are getting based on: current UV index, environment (park, beach, yard, city), time of day, your skin type, and the type of sun protection you use. Start the app’s built-in timer when you head out and it will alert you when it’s time to go inside. A “splashproof” speaker lets you enjoy your favorite tunes on these portable Bluetooth speakers anywhere–at the spa, poolside or out on the boat. The Archeer A106 is an under $20 value that delivers up to 20 hours of playtime in a small form-factor pumping out 5W with enhanced bass. Up the volume while going solar and never have to worry about charging your speaker with the $50 Airecho Dual-driver Stereo Bass . To really get the party going, the $80 JBL Flip 3 has the best sound for under $100 (how much do you really need to spend for outdoor, summer sounds?) and comes in 8 fun, different colors. We also recommend getting the $32 Accessories Kit if only for the flotation strap so if you lose your grip filming a bat-ray, your camera doesn’t sink to the bottom of the ocean! And the 32 GB memory card, extra battery, charger and carry-case are also great to have. For walking on the beach or catching up with your summer reading by the pool, the $98 Sennheiser PX 200-II i Lightweight Supra-Aural Headphones with iPhone controls are comfortable to wear and pack easily in small bags. Just shut the world out so you can snooze or unwind without interruption, anywhere. Other handy gadgets include portable wireless routers , super-thin but durable laptop and tablet covers, travel battery chargers, and shockproof/waterproof smartphone cases . Before you hit the beach or break out the surf board, check these apps for the latest weather, UV levels, wind conditions and updates on swells at your location. WeatherPro (free – iOS / Android) reports wind speeds, detailed daily weather and forecasts, and UV index by location. Developed by the United States Environmental Protection Agency (USEPA), the SunWise UV Index app (free – iOS / Android) provides daily and hourly UV forecasts, and also suggests clothing to wear to protect you against those harmful rays. Serious surfers will want to check in on Oakley’s Surf Report 2.0 for every pertinent surfing detail you need: swells and tide times at your location, information about weather, surf conditions, tides, current air and water temperatures, and more. Plus you can see the weather in real time by connecting to one of their 140 live streaming HD cameras (through Surfline.com). You can get updated surfing conditions and user insights about breaks from surfers around the world at MagicSeaWeed.com, with regional reports on all US and Mexico beaches. It’s important to know about high and low tides before you head out; Tides Near Me (free – iOS / Android) is a simple app that give you tidal conditions around the world, for up to seven days in advance. It also gives you times for sun and moon rising and setting. For those who love the great outdoors and camping trips, there are many camping apps to choose from to help you find campgrounds (Camp Finder), get recipes for campsite cooking, even apps to help you survive in the wilderness. What Knot to Do in the Great Outdoors for the iPhone provides detailed instructions on how to tie 70 knots in six categories. Localeikki (for iPhone/iPad) provides detailed routes for running, walking, hiking and mountain biking where you are. It allows users to upload and share favorite trails. All Stays has a suite of apps that tell you about campgrounds (tents and RVs), rest stops, truck stops, outdoor stores and lots more. No one likes to be bored when they travel (adults or children) but relief is here for those traveling with mobile devices. Load yours up with child-friendly games and activities, and books for everyone. E-readers Kindle and Nook are now joined by Apple’s free iBook app. Stargazing on the beach at night is all the more spectacular with Star Walk which uses the smartphone’s camera as an interactive cosmos guide; the camera follows your movements to reveal the constellations and celestial bodies you are looking at. Google Sky Map one-ups this with a real-time annotated map and augmented reality view of the night sky. If you don’t want to read in the sun or just want to listen, download Amazon’s Audible (Try Audible and Get Two Free Audiobooks) , which offers thousands of audio book titles. This is an essential app for users with vision impairments as well. 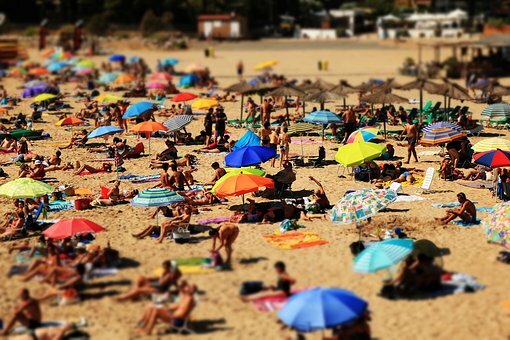 Spend more time sunbathing and less time chasing down your travel plans with Tripit. You can forward all your flight, hotel, car rental and restaurant confirmation emails to the all-in-one travel plan organizer; it will create a detailed daily itinerary with all your information in one place, accessible on any device. Edit your information and synch it to your calendar for smooth sailing along the way. For those traveling to more distant spots, Triposo offers personalized suggestions of where to go and what to do, maps, and shared experiences from millions of travelers in 25,000 destinations worldwide. You can read up about the history and culture of your destination, get practical information about local currencies and languages, discover places to eat or stay… even book a day trip. So what are you waiting for? Get packing, get planning, and hit the beach, armed with apps that get help you make the most of your travels. Do you have any favorites you use or have discovered? Share them with us by tweeting at @STECH411 or visiting us on Facebook!